View the 2019 EDmarket Media Kit, containing all the essential information about advertising with EDmarket. Adrienne Dayton is the managing editor for Essentials magazine and Essentials Weekly e-newsletter. If you have story ideas, questions about press releases, advertising or social media, contact Adrienne or call 800.395.5550, ext. 1031. EDmarket prides itself on offering the highest quality trade publications for the school market. EDmarket's award-winning publications provide all the latest trends, tips and resources. 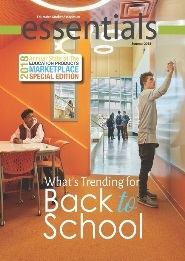 Companies in the educational products marketplace rely on Essentials magazine to cover trends impacting the industry. Distributed quarterly in digital format, Essentials includes a special summer State of the School Market edition, which provides the latest statistics and trends in the education market. Members have unlimited access and download capabilities to the archive section of EDmarket's Essentials magazine and Essentials weekly. Published by MDR in cooperation with EDmarket, this 84-page report is the third in MDR's State of the K-12 Market 2018 series. Those interested in the intersection between space and pedagogy, how students react to different learning environments, and the opinions and experiences of teachers in the classroom, will find this report illuminating and useful in developing best practices for designing education spaces. EDmarket members get a 20% discount. EDmarket Distribution Opportunities: Educational Service Agencies and Buying Cooperatives provides an in-depth look at two unique distribution channels of interest to school marketers and provides a deep dive and case studies for ESAs and Buying Coops. Sales agencies from companies with products and resources to support these channels can learn how to be a valuable partner to school districts. A weekly member only e-newsletter that provides the very latest industry and education market news. Only EDmarket members receive the school market's most valued reference guide—an essential tool for your business. It is a complete listing of all members by membership category and locations, with easy-to-use personnel and product group indexes. Your company is listed free with membership. The Education Market Association is pleased to present its 2018 Annual State of the Educational Market Report, a supplement to EDmarket’s quarterly Essentials magazine. The Annual State of the Educational Market Report covers the most pressing education issues of this year such as K-12 trends, funding data, annual construction costs, technology trends and more. EDspaces Insights is a monthly, digital publication, featuring original articles by industry thought leaders on a wide range of issues about planning, design, financing, construction, capital improvement, maintenance, and operations. Insightful analysis about how developments in pedagogy, technology, and the education industry impact learning environments, are part of every issue. The EDtech Distribution in an Evolving Marketplace Report, features data gathered from interviews with key industry leaders conducted by researchers at the Harvard Graduate School of Education. 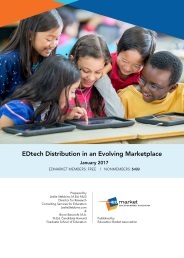 This report, sponsored in part by Stages Learning Materials, provides the most current information available on the shifting nature of the K-12 market for EDtech products.